Constructed of prefabricated concrete blocks in 1901, the Cape Byron Lighthouse stands on the most easterly point of the Australian mainland and is Australia’s most easterly lighthouse. It is built in the James Barnet style, by his successor, Charles Harding. James Barnet, the New South Wales colonial architect, was renown for his towers having large ornate crowns and are easily distinguished. The first-order optical lens, which weighs 8 tons, was made by the French company, Societe des Establishment, Henry Lepante, Paris. It contains 760 pieces of highly polished prismatic glass. The original concentric six wick burner was 145,000 cd. This was replaced in 1922 by a vapourised kerosene mantle burner which gave an illumination of 500,000 cd. In 1956, the light became Australia’s most powerful, at 2,200,00 cd when it was converted to mains electricity. At the same time the clock mechanism was replaced by an electric motor. An auxiliary fixed red light is also exhibited from the tower to cover Juan and Julian Rocks to the north east. A great banquet was arranged for the opening in 1901 and many dignitaries, including the NSW Premier of the day John See, were invited. However due to adverse weather conditions the premiers ship was delayed by till the following day and the banquet was held without him. The opening by the Premier took place a day late on the Sunday. 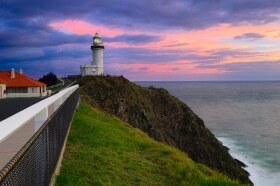 It is interesting to note that Cape Byron was named by Captain Cook after John Byron, grandfather of the famous poet. The ownership of the reserve was handed over to the Parks and Wildlife Service of New South Wales in 1997. The reserve was already under a lease to the Cape Byron Trust who maintain and secure the site and buildings. It is currently used as a base for whale watching. Take a step back in time and discover what the daily duties of the lighthouse keepers and their families at Cape Byron would have been like on the Historic lighthouse tour. See the signal flags and the keepers desk and uniform, providing a reminder of days gone by when three families were living at Cape Byron from 1901 to 1989. Enjoy climbing the tower, stopping at each of the three levels before stepping out onto the top balcony to get a birds eye view into the marine park below and surrounding hinterland.